The Cooking Photographer: Deep Fry That Turkey! I love to deep fry things. I think this goes back to my first real job. Real meaning when I wasn’t paid in peanuts for picking strawberries, or placing flyers on car windshields before the “working age” of sixteen. Slaving away at McDonald's and being paid minimum wage for the first time in my life, I was stepping up in the world! I worshipped McDonald's back then and could eat their food for breakfast, lunch, and dinner for at least a week straight. My favorite job was working the fryolator. I loved watching the hot oil come alive into a monster of noise and bubbles when I dropped in fries, chicken nuggets, and Filet-O-Fishes. Since that time I’ve been obsessed really. I fry everything I can, and have gone through multiple fryolators in my adulthood. Nothing though, captures my attention more than the giant turkey frying pot that my brother and sister-in-law bought me for Christmas one year. I love LOVE that thing. Although now, after many years of singeing off my eyebrows and arm hair while lighting stoves and grills, I have a nice healthy phobia of propane and fire together. Jesse and Dishboy Scott had to help me by taking orders, lighting and un-lighting as I directed. For some reason I have no fear of skin melting hot oil, and ecstatically enjoyed, manically really, frying this turkey. What I learned deep frying turkeys. 1. Make sure you have enough oil to cover the bird. You might need to go a bit above the fill line on your pot as I did, but never put in a bigger turkey than your frying instruction manual says it can handle. 2. Peanut oil is expensive and impossible to find in my 150 mile shopping radius. I used Kirkland Signature Creamy Liquid Shortening from Costco instead. It worked great and only cost about $20 for a vat I could nearly swim in. Well, if one would want to swim in creamy liquid shortening. 3. Heat the deep fryer 25 degrees above where you want to fry. I heated the oil to 350 so my final temperature was 325 degrees Fahrenheit. 4. Wear full battle rattle: Pants, closed toed shoes (no flip flops you college students! ), long sleeve shirt, asbestos gloves, hat, protective eyewear, kevlar helmet, and flak vest. Oops those Army days are over. Skip the kevlar and flak vest. However, if you’re a female with long hair like I am, or Fabio, tie it back! There’s nothing like the smell of crispy fried human hair. 5. Make sure your bird is completely thawed and dry, inside and out. Very extremely incredibly exceptionally completely thawed and dry. 6. Turn off the fire before lowering in the bird. This will enable you to spend Christmas, New Years, and Valentine’s Day far away from the intensive care burn unit. 7. Lower the bird very extraordinarily painfully slowly into the oil, over about 1 ½ minutes. If the oil boils too furiously, pull the bird up a bit and try again slowly. 8. Then turn the gas back on. Monitor the temperature. 9. Cook birds for about 3 to 3 ½ minutes per pound until crispy and golden. 10. Turn off the fire before removing the bird. Again, holidays in the burn unit are no fun. Have a foil covered rimmed baking sheet very close, and lift the bird onto it. 11. 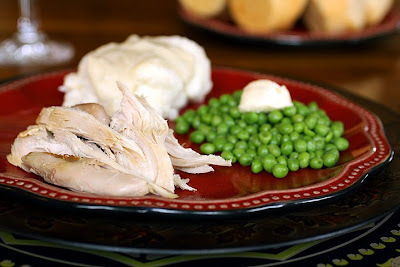 Frying a turkey is fun, thrilling, and yummy, and now I want to do it every week. So please, take what I’ve learned and go forth terrified, but determined and excited. 1. Chow’s “How to Fry a Turkey, 10 Steps to Satisfaction”. 2. Alton Brown’s Fried Turkey episode on YouTube. 3. Gumbo Pages has lots of excellent information. They also bring up bird injections. I just fried the darn thing plain though, but I love their article. 4. 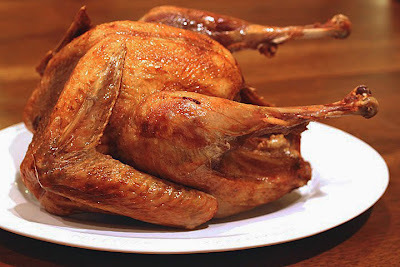 EatTurkey.com. What a cool site lol! Of course they show us how to incinerate these birdies. Plus they tell us how to gauge the amount of oil to use. 5. Wikihow has a step by step guide. 6. About.com also has step by step instructions. 7. Are you tired of these yet? Yes? Convinced? No? Let’s carry on then soldier. 8. For fun, how about How NOT to Fry a Turkey on YouTube? I could go on and on and on as Google is a god-like resource. I think you get the picture though. Deep fry, deep fry, deep fry and deep fry that Thanksgiving turkey to golden perfection. Just take those few precautions while doing so and you’ll have a beautiful golden turkey that’s crispy on the outside and juicy and perfectly cooked on the inside. Save that carcass for broth! Those deep fried bones are a goldmine of flavor. And as my friend Robin from Texas says, "Don't fry your turkey on your front porch like they do in Texas!" Evidently there are a number of house fires fueled by too many Bud Lights and porch turkey frying on Thanksgiving Day. Thanks Robin, I never thought of that one! I have got to visit Texas. Pictures and insanity provided by Laura Flowers. Girl! You have more courage than I do! But that fried turkey looks awesome! I've always wanted to try deep fried turkey, but I'm afraid I'd burn my house down trying to make it. Thanks for all the tips! I love deep frying because it looks so cool when it gets all bubbly and makes those cool sounds, but I don't generally like to eat fried foods. I would probabaly be way too scared to deep fry and entire turkey! Ha - guess what my first real job was... yep, MickeyD's. Started at the Kayway (soda machine) and fry stations. Then register, grill, and later a a swing shift manager - it was a 5 year love/hate relationship, but it taught me great work skills. It's also where I met my husband :). On to the turkey - every year I think to myself, "One year I'm going to get one of those contraptions and fry a bird". So far not, but one day I will! PS - a former neighbor told a story of a friend who burned down their garage when frying a turkey. Over filled the fryer with oil and it overflowed when they put the turkey in. Big fire... big mess... bye-bye garage. PSS - I found a gallon of peanut oil at Costco. 1/2 gallons are available at my Super Wal-Mart as well. ButterYum: yeah, that's why it is critical (imo) to TURN OFF THE FIRE when lowering in your turkey! That way if it overflows, all you get is a large mess instead of a large inferno. Laura: Loved the post (I'm still chuckling). I wonder what other large items we can fry in your ginormous fryer? This is my type of blog. This is my first visit, but as soon as I seen "FRY THAT TURKEY". I knew...Love your post and your site!!!! 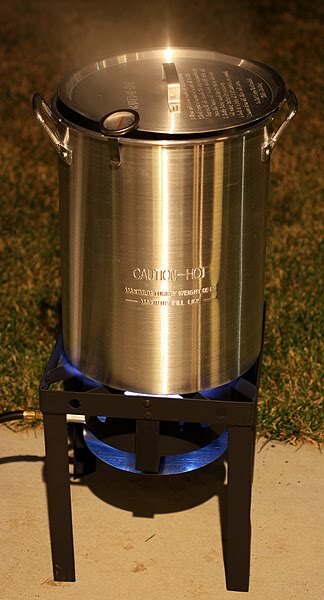 This is SO exciting, to get first hand info on frying a turkey!!! I saw on the news that the number of house fires during the holidays (from frying turkeys) really goes up. What a GREAT post!!! Hi Miranda and welcome to my little area! Hi ladies and Scott! Thanks for visiting. And Coleen you have to try this! Lol Patricia! Have we always lived the same life? No wonder I like you! Danielle I can't stop laughing!!!! That's awesome. Take copious notes. This is one I'm hesitant to try. Do you have to discard the oil when done? Please be careful! OMG I've always wanted to try this!!! I'm definitely jealous! This is all kinds of AWESOME! The only deep-fried turkey I've seen so far has been on Mythbusters, where they put a frozen one into a vat of hot oil and blew it up! That is one amazing deep - fryer you got there. I've always wanted to know how these deep fried turkeys taste like! The first picture says it all! What a great post as there are loads of resources here. Thanks for sharing! We just found your blog and love this post! I used to live in Texas and have deep fried several turkeys, but out in the backyard and with only a few Bud Lights. I always liked to inject the turkey with creole butter, and when it was done, sprinkle it with Tony Chachere's (or however you spell it). Love your writing style, too. Can't wait to read more. Chef Elizabeth I had no idea! Lol nice. Cliff- Welcome and thank-you for the comment! Shaz- Lol! I saw that episode too. It was great. Great post....but I'm STILL afraid. Besides the red hair...Lucille Ball and I have a lot in common and I just don't trust me with with something that could catch fire and possible kill or injure people I love. Haha you know this time of year is always curious for me b/c even though I ate some meat when I was young, turkey's not really used in Chinese cooking and so I don't know what it tastes like! My boyfriend tells me deep-fried turkey is amazing, though. You're a brave woman, Laura! YUM! My brother in law in deep frying a turkey for the first time so I sent him this post! He never listens to anybody, so it should be interesting. Happy Thanksgiving! You go girl!! I can't say I am gonna be deep frying a bird any time soon.....but I enjoy reading your experiences! Sounds delish! Hi hun, I am still amazed at how fast the turkey cooked in the deep fryer. We are going to have to keep searching for peanut oil for the next time. I cannot wait to see what your next idea is to do with that deep fryer set. I love you. We were going to deep fry our turkey this year, but the city discouraged it! Something about the fact that we will in wild fire country! :) Your turkey looks gorgeous and i'm sure tastes just a good!! Loving the blog and all the recipes! Speaking of frying, do you make a monte cristo? There is inexpensive peanut oil at walmart in Moscow. Glad to hear they have it now. I used to make those Cliff! They were my favorite for years. I should try again. I've never fried a turkey - I wouldn't know what to do with all the oil after you're done. But I have to admit that crispy skin looks fantastic. Wow, what a great blog. Thanks for the info. If I ever get brave enough to attempt this I'll know right where to go for the right information! Happy Thanksgiving! You have me down rolling on the floor laughing! hysterical! But this bird looks darn tasty! And I loved the summer younger bro worked at McDo's and brought me home breakfast and lunch all the time! Great tips!! I should have passed this along to an old family friend last week, his house caught on fire and burned to the ground after trying to deep fry a semi frozen bird. Oh.. and yes,I am from Texas!! Natalie oh no! Yikes! I'm hoping they'll all be ok! Great post. A lot of good information in your blog and in your comments. Helpful hints. I love deep fried turkey! Love fried turkey, but will never try doing them myself.."SCARED"=;). Inspite of all your helpful hints..still scared! lol! But i will eat all the skin and wings!lol! I havent even had a fire yet in our fireplace...to scared to burn my place down. Thanks for all the info. I also email you my address! I am super excited to try the soup. You have a very nice blog that catches the eye, not to mention yummy looking food.